There are a lot of different networks to buy PPV traffic from and a few have done well for me over the years but unfortunately they’ve all, at one point or another, become saturated and that’s hurt my ROI. So I decided to try advertising on CPAlead with their PPC Ad System and see how buying PPC traffic compared to buying PPV traffic. Our first image is of the dashboard which provides an overview of your activity and performance and the second displays the stats of an individual campaign for a specific time period. Not only is CPAlead’s PPC Advertising Platform traffic platform pleasing to the eye, but the functionality is also great. Creating a new campaign only takes a matter of seconds as you need only input your URL and creative then select the GEO or GEOs that you’re looking for. When it comes to GEO selection, CPAlead has done a very good job of streamlining the process by allow you to choose from preset GEO groups such or Continents. This way, you can simply check off “North America” or “Tier 1 Countries” as opposed to having to individually selecting each and every one that you want to run your campaign on. 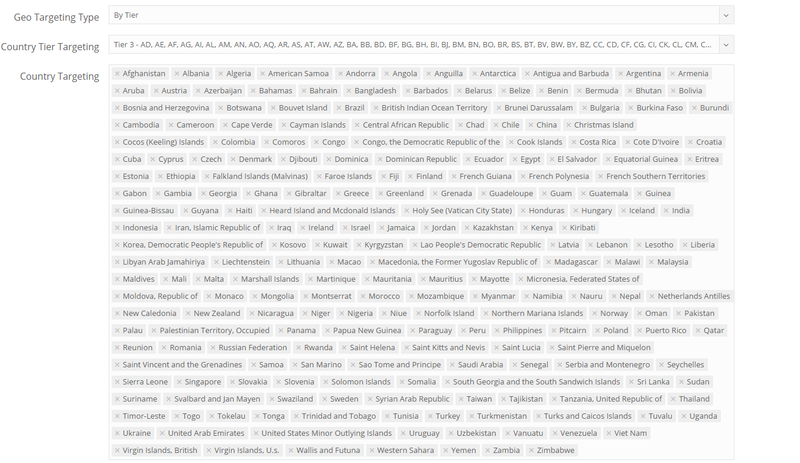 Of course, CPAlead lists all of the countries included in any of their preset groupings just in case you’re uncertain. Here’s a screenshot of CPAlead’s largest and least expensive tier(3). Now before you’re able create or manage any campaigns, you will need to fund your account. Unlike buying PPV traffic from most PPV networks, that require a minimum of $500 or $1,000, CPAlead’s PPC advertising platform requires only $50 to get started in buying PPC traffic. I believe this may be the lowest initial deposit requirement in the entire industry but don’t quote me there. To put it in perspective, you need to pay 10x as much to buy traffic from 50onRed, who have a minimum of $500 and 20x as much to buy traffic from Leadimpact who asks for $1,000. My belief is that the low $50 minimum is due to the fact that CPAlead is eager to prove themselves as a good source to buy traffic from and want to keep a low barrier of entry for new affiliates. You can then provide payment via credit card or PayPal quickly and easily unlike other platforms that force you to take a round about method in order to fund your account. It’s not a big deal but the convenience is always welcomed. CPAlead’s PPC traffic comes primarily from interstitial and pop under ads on desktop with interstitial app walls on mobile which is fairly similar to what you see when buying PPV traffic. More importantly, CPAlead’s prices on a cost per click basis are extremely low (you can find the most current copy in their dashboard). Advertising with CPAlead so far has gone well and traffic has performed very well for me. What I like about buying PPC traffic is that I can be a lot more efficient with my spending than I could with buying PPV traffic. When I pay for PPV, CTR is a big concern to me since we all have some winners and losers within our campaigns. Its frustrating to run a PPV campaign and not get the clicks that you’re looking for and that can also hurt your ROI. With CPAlead, I pay only when I receive clicks. I should note that you still want to focus on having an attractive ad campaign with a strong CTR. Even though you’re not paying for impressions, you want to fill your budget and get clicks quickly. A weak CTR or ad campaign will get less clicks than others and that tells you that you need to make some optimizations. In the end, I get all of the same data in understanding how effective my campaigns are on PPC as I do with PPV. The difference is that I pay $0 for poor (CTR) performing campaigns on PPC whereas I burn impressions and money on PPV. The minimum bid varies from country to country but the average cost per click is that you end up paying always lower than the bid you need to enter. CPAlead explains that they set the bid price higher than what the anticipated average is to ensure that your ad is competitive and will get fills without you needing to constantly be making changes. Where possible, they fill you at a lower rate. CPAlead goes so far as to publish their pricing schedule with an emphasis on what your average cost should be. In my experience so far, the average seems to be very accurate. I recommend setting your default bids on your campaigns to the suggested max bid in allowed in the country that you are targeting. If you are promoting an affiliate offer or website that allows traffic from multiple countries, I suggest taking a look at the CPAlead tier targeting option discussed earlier. You can customize the tiers to your liking but CPAlead has three pre-sets available to choose from as well as Continental targeting. You’ll want to look at each tier closely to make sure that it matches up to what you want and if a country of interest is missing, you can always add it in. Doing this saves you a lot of time and makes the entire process more efficient. Overall, traffic has performed well for me. When I have a good campaign, I see clicks come in very quickly and my ROI is amazing. When clicks don’t come in as quickly, I know I need to make some optimizations because it tells me that my campaign isn’t attracting clicks. Advertising with CPAlead represents a fresh new way to make good money and get a strong ROI for media buyers, online advertisers and mobile app owners. Their PPC traffic definitely has some advantages and differences compared with buying PPV traffic and is worth a try and with such a lower barrier of entry. This isn’t to say that you will do better buying PPC traffic than you will PPV traffic but I think anyone looking to purchase traffic at all should give it a shot and see how things back out for them.